I really do love this leaf image from PTI's Text Boxed! I especially love how it's such a bold image and therefore works well with spectrum techniques. For this one I applied the spectrum of colours directly to the stamp. 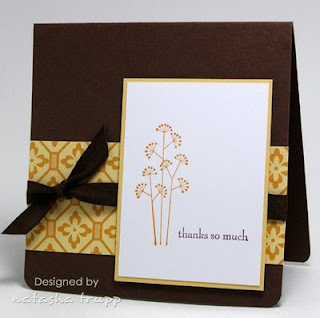 I used Memento dye inks, as I find these really stick and blend well on clear stamps. The order was Dandelion, Cantaloupe, Tangelo, Potter's Clay. I love how well the colours blended! 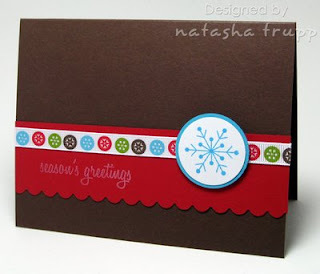 I stamped my greeting into the image using Rich Cocoa. The rust paper was embossed with clear embossing powder. Finally, I really wanted to add ribbon, but I wanted to keep the earthy vibe. 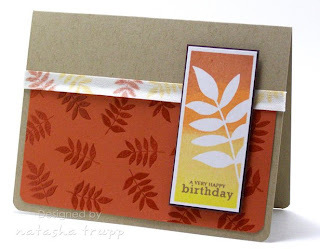 So I found some poly twill and stamped the leaf image onto that. It worked quite well. The ink has spread a little bit more (I used a dye ink), but I like the softness that adds. 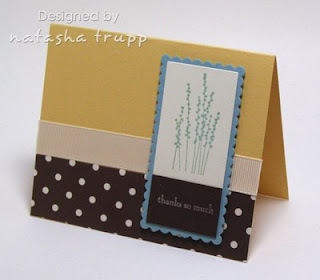 For the past few months I've been meaning to participate in Papertrey Ink's Blog Hop. When I saw that this month's theme was polka dots, how could I resist?? I actually forgot that today was the 25th, so I relied on an "old stand-by" layout, as I whipped this one together in 20 minutes or so. I changed it up a bit, since I added these cool mulberry primas I bought last week. They coordinate so nicely with Berry Sorbet! I finished the flowers off with pearls, since that went well with the shine of the satin ribbon. Can't wait to see what everyone else did! How cute is this cupcake image! I thought it'd be fun to make the image very dimensional. 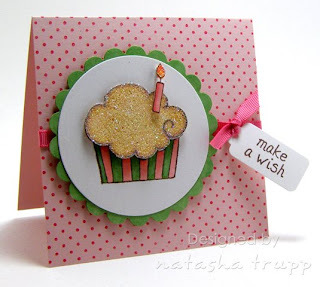 I stamped the cupcake on the white, then I stamped the cupcake again and the candle on some other white cardstock. I cut out the top and the candle, coloured everything then, covered bits of the top and flame with glitter then pieced it all together. For the little tag, I started out from a cut out double-ended tag. I can never get tags tied exactly where I want, so I placed the base strip of ribbon, then carefully tied the tag with the another piece of the same ribbon onto that strip. I was quite happy when it actually worked. It's an almost seamless look- it looks like the knot is attached to the base strip. Another tip, one I've done in the past, but is worth repeating: if you chose colours of markers before selecting your cardstock, consider colouring the edges one of your layers with the same markers. Here I coloured the green stripes with Willow, so I cut out a scalloped circle from white paper then just coloured the edges before attaching the cupcake image. Easy and quick! 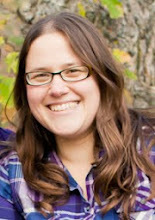 A week or so back I was working on a design for the CaS blog. I also happened to be going through an old desk and found beads that day. 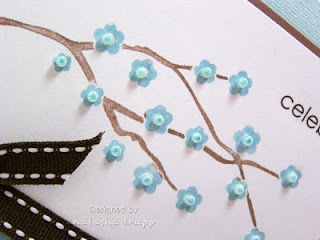 While making the card, I realized that beads would be the perfect addition to the cherry blossom branch in Eastern Blooms. Although it's a cute idea, it didn't really fit into my plan for something quick, clean, and simple. So that idea got shuffled to the back of my mind. This weekend, I decided to give it a shot. I have to say, I love how it turned out, and I have a LOT of beads, so I will be sure to try this more often. To apply the beads, I added a tiny droplet of crystal effects to each flower center. Next I placed the beads into the glue using tweezers (this is a great tip to help you from going insane). Then, let dry. It's not super complex, but it does require a bit more patience than some techniques. For the rest of the card, I decided to pair Baja Breeze with Soft Sky. I added a bit of Close to Cocoa in there. That's definitely one thing that makes me a tad sad about the In Colors- so many of the past years' colours work well with the current colours. 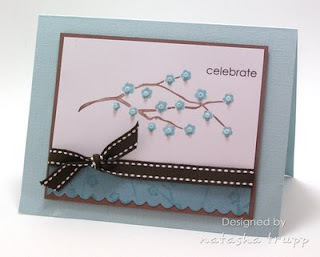 Other details: the Baja scalloped strip was stamped with Baja coloured branches, than again with Soft Sky Linen (it feels like forever since I got creative with BG stamps!) The strip of ribbon is actually just a tad darker than the cocoa, but it looks crazy dark in the photo. Anyway, it's nice when a card turns out exactly as planned. I really like the layout and seriously, if you have lots of beads lying around, think about applying them in this way! 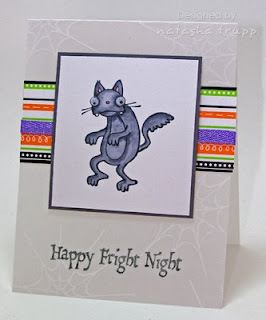 Challenge Focus: Create a Halloween card or treat holder. Required Element: Googlie Eyes! We want to see those eyes jiggle! 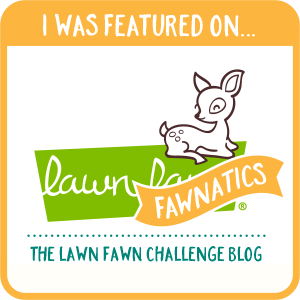 Restricted Element: No pumpkins! You'll have to use a different image associated with Halloween! Here's my card, I kept it simple, but I quite like it. I started off by choosing one of the DoodleFactory Halloween II images. This is Trouble the cat. I used various grey markers to colour him in. Next came the googlie eyes. 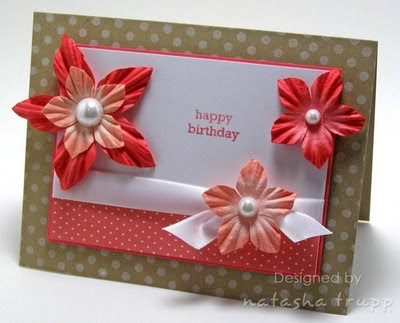 How perfect are these embellishments for this image!! They don't look out of place whatsoever! I added some Doodlebug paper, a bit of sparkly ribbon, and then put everything onto a vellum card base (which was decorated with some white craft ink and spiderwebs). I can't wait to check out everyone else's! 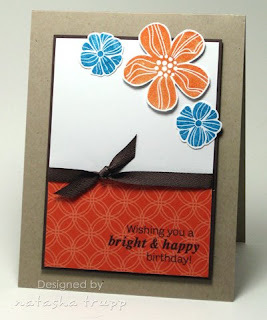 This card started out simply because I wanted to use this long scalloped rectangle. So I started with that, then found an image that fit nicely into. One of the images from Pocket Silhouettes fit in there fantastically. The sentiment comes from that set as well. Next up was deciding what colour would compliment the mix of vanilla, baja, and chocolate. I looked around my desk, saw this piece of So Saffron cut to some different dimensions and thought, perfect. I really love how this colour combination turned out, especially since it got thrown together in a pretty random fashion. Here's another quick, clean, and simple card featuring my new SU stuff. I am quite enjoying the new colours, papers, and rub-ons! For the flowers I did the old reinkers and blender pens. As a cheaper way to experiment with the new In Colors, I buy all 6 reinkers and a pack of the assorted cardstock. Then I see which I end up using the most. The reinkers I simply use with blender pens. A little goes a LONG way. Plus, if you decide to pick up the full size stamp pads, you're all set for later! I suppose what I feel is missing from this card are some leaves. I know the set is called Eastern Blooms, but I really feel they should have included a matching leaf in the set. I really wanted to add some Kiwi coloured leaves in there, but I didn't know what set to take them from. I spotted this adorable American Crafts ribbon at Michaels last week. 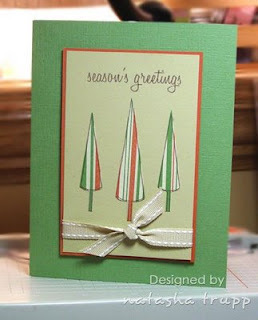 I loved the addition of turquoise and brown to the more traditional colours of red and green. I really wanted to make a card featuring the ribbon. I made this simple layout to accommodate the ribbon. It's a super simple card, but I'm quite happy with how it turned out. I'm always amazed at how "full" such an open-spaced card can feel. It was the beginning of stamp club recently(the first rule of stamp club...there is no stamp club- sorry I had to throw that out there, long-time inside joke) so I was having fun with new catalog stuff! I was quite impressed with myself tonight, I tidied a big chunk of my space, which always helps re-inspire me. Here are the cards, they are as good as SU-only. The items that aren't SU could easily be replaced with SU product, I just used what was nearest to me. First up- a little bit of Pocket Silhouettes with Haiku paper (love that stuff!!!) I really love the look of the solo silhouette image with the sentiment just off to the side. All that open space with the bold images just makes me happy. Next up, what, no stamps??? I had to have these rub-ons, and instead of just looking at how pretty they are I actually used them. I started by placing the rub-on on some white cardstock. I cut that out, then I used some more Haiku paper and cut equally (near equally, really) sized squares and put together this quaint little layout. 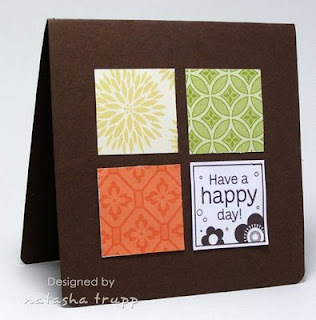 Both cards are 4.25x4.25 and used the smaller corner rounder on the bottom edges. I was feeling a tad uninspired the other day. That was quite a disappointment, especially since it was my day off. I was determined to make something though. So I went into my paper stash and pulled out this paper from last year's Apple Cider pack. I used that as my inspiration. I also happened to have some Christmas music on in the background (the Mantovani Orchestra one, it's nice to listen to all year round, actually). The music inspired me to make something Christmas. I know these aren't typical holiday colours, but I really like how it turned out. I did some paper piecing, something I so rarely do, and used a nice textured paper for my base.